Dallas Fair Park - 20. Leonhardt Lagoon. Named after local philanthropist Dorothea Leonhardt, a man-made lagoon lies east of the African American Museum and south of the Midway. It was constructed with funds from the WPA to serve as a peaceful, beautiful place to take a break from the bustle of the exposition exhibits. As part of the overall design, George Dahl placed it at the center of the civic section. 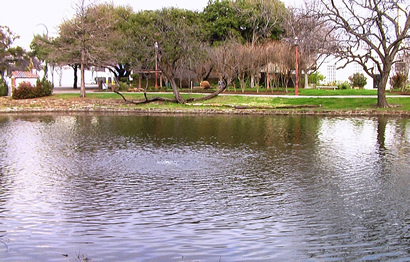 Leonhardt Lagoon was surrounded by a science museum, an art museum, an aquarium, and a band shell. Over the years, the lagoon slowly died from environmental neglect. The surrounding lawn was often given fertilizers, which always flowed into the water whenever it rained. This, in turn, resulted in an overgrowth of algae and the appearance of green slime over the water. To make matters worse, the shoreline erosion brought dirt, mud, and grass into the equation. The fish died, the animals stayed away, and the plants refused to flourish. Furthermore, the eroding edge proved to be unsafe. 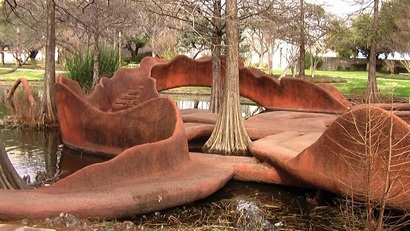 In 1981, Pat Johanson was asked to redesign the lagoon because the sculptor from New York City had previously shown her skills at garden design while working for Cyrus Field and House & Garden Magazine. Unfortunately, a lack of funding delayed the project until 1985. The first step involved completely draining the lagoon. All the excessive vegetation was removed. While this was going on, Johanson built two sculptures. She based the first sculpture on a Texas plant called the delta duck-potato, known for its tangled roots. The second one referenced a native fern called pteris multifida. Both structures were dedicated to the memory of Dorothea Leonhardt after she completed them. Once the artist finished her work, the lagoon was refilled with water, followed by the introduction of plants native to the region. Afterward, aquatic plants capable of living in shallow water were added while bulrushes and wild rice were placed on the shoreline. The final step involved the introduction of fish into the area. The lagoon has prospered since its restoration and remains a wonderful place to relax in a peaceful, natural setting. During special events, visitors can enjoy riding paddleboats modeled to look like white swans.